Representative Rosa DeLauro, Democrat of Connecticut, who will lead the appropriation subcommittee that funds education, said Ms. DeVos is one of the few cabinet secretaries she has not met with. "They're good at what they want to do, and we don't count for anything," she said. DeLauro, who has clashed publicly with Ms. DeVos, said she plans to "hold the secretary accountable for the education out of the education department" through staffing and program cuts. She said she will be recruiting proposals to create a $ 1 trillion program for finance vouchers for private and parochial school tuition, for low-income students and for zeroing out funding for teacher training. Instead, Ms. DeLauro said she wants to champion new investments like community schools and early childhood education. 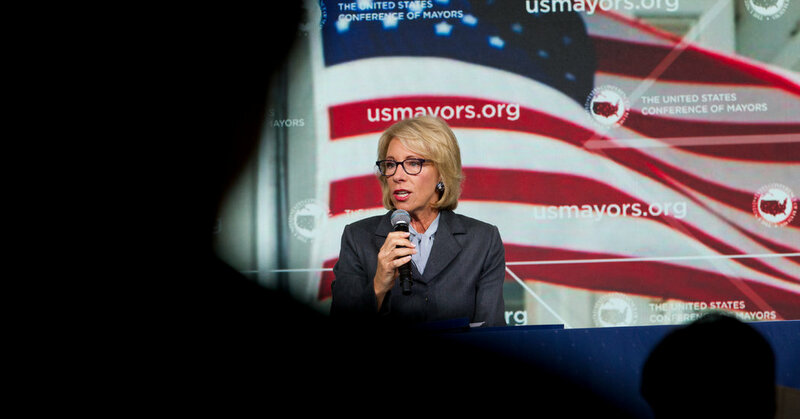 "I believe that, overall, the mission of the Department of Education these days is to privatize public education, and I want to block them," she said. "On the other hand, I see this as my opportunity to look at how we can provide new opportunities for new people." Representative Mark Takano of California, the chairman of the House Committee on Veterans' Affairs, said he will scrutinize how Ms. DeVos's proposals for deregulate for-profit colleges could allow for abuses of the G.I. Bill, which provides veterans with tuition assistance for higher education. He recently made a group of college accreditors, "I promise to continue to crack down on predatory institutions." When the Democrats Took The House, Michael J. Petrilli, The President of the Conservative Thomas B. Fordham Institute, urged Ms. DeVos to step down rather than subject himself to "show trials." Now that Ms. DeVos has shown no signs of resigning, Mr. Petrilli anticipates that Democrats will discover they have limited power and the department will carry on, immune to bad press. "This is a department that does not have much to lose," he said.